Looked good, but fit like a box. Response from Charles Tyrwhitt: We've worked hard to keep our shirts looking and fitting great, so it's disappointing to see you weren't too pleased on this occasion. No changes have been made to the Slim Fit shirts since you last purchased a couple of years ago, so I'm sorry they haven't fit quite as well this time around. You may wish to give the Extra Slim Fit a try, however, as these will provide a slimmer and more tailored look. Maybe you would like to pop into our Houston store and try a few on - you can always then make an exchange! Response from Charles Tyrwhitt: I apologise if your shirt arrived slightly creased from transit, happily however this should be easily remedied should you hang your shirt to dry after washing. This allows for any creases to drop naturally, and you can also lightly tumble dry your shirts to reactivate the Non-Iron process. I hope that is helpful! Response from Charles Tyrwhitt: This is certainly disappointing, but thank you for sharing this with us. It may well be that you need to look at the slightly thicker/heavier weaves going forward. This particular shirt is Poplin-based, which makes it very light - which can be a touch harder to keep looking smooth. I would definitely recommend trying some of the non-iron Twill shirts, as these are extremely popular and a great all-around option! Shirt looks great and fits well. I'm pleased with the purchase, but what I don't care for is the fact that the shirt is displayed with a tie (which it does not include). I understand the "display purposes" only bit, but I would appreciate it if a link to the displayed tie could be included in the item page, and made to be prominent for easy ordering should I desire to do so. 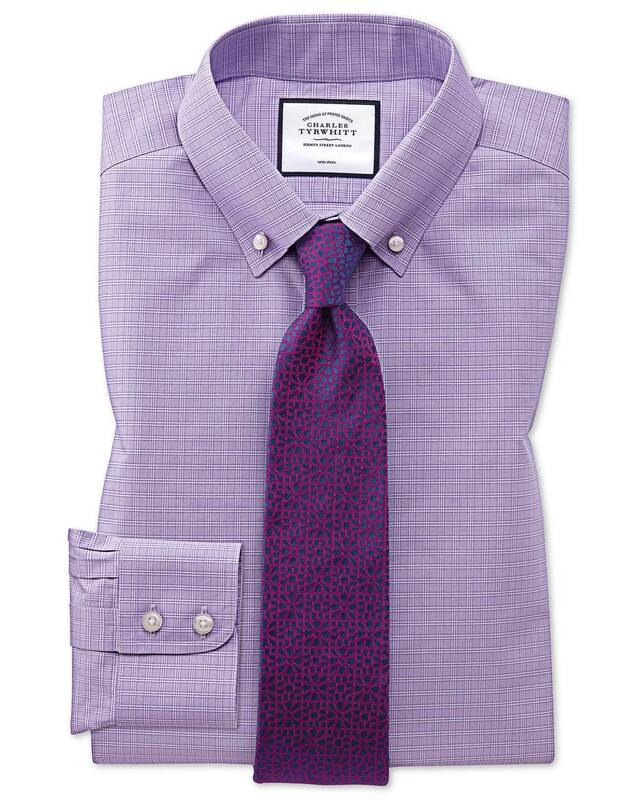 This is the first button down collar shirt I’ve ordered and I think it looks nice. Shirt is good as always.